As a sadistic killer holds a group of archaeology buffs hostage deep in the jungle, one of the tourists escapes. Paul Silver came on this trip to learn about the ancient ruins at Piedras Negras, a site that may hold secrets from twelve thousand years ago. For now his objectives are set aside. He has to plan a rescue. The captives – his friends – are so far from civilization that their release could put them in more peril than before. The Guatemalan jungle is a dangerous place, full of predators as frightening as the rebels themselves. Paul can’t act quickly enough to save everyone from the rogue guerilla and his men but as the murderer announces his next victims, Paul must move, regardless of the dangers. He rescues Hailey Knox, a beautiful archaeology student who discovers a connection at Piedras Negras linking two ancient civilizations to this part of the Americas – the same mysterious connection that Paul Silver came here to find. After Paul deals with the rebels, Hailey shows him a cave where an astonishing wall and a secret chamber will reveal how and why an Egyptian pharaoh was doomed to eternity in hell. 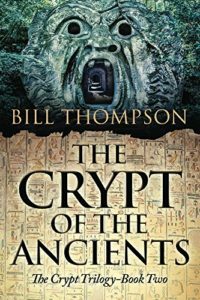  Archived in Books, The Crypt Trilogy.